I just love the colors in this design. I can tell I'm going to have a lot of fun stitching this one! Well, I'm going to get stitching while Matthew is taking a nap! Write soon! 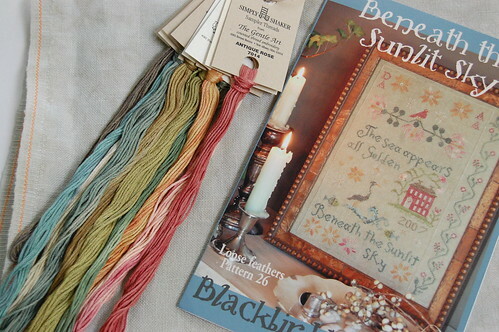 Blackbird Designs is something I am really into right now too! I want to get the fabric and threads for Flowers for Sarah but I am thinking of making it into a wall hanging instead of a needlecase because it is too pretty to fold up into a needlecase. I too had to start over on my project, Small Tokens pin cushion yesterday. I love this choice you have made and look forward to seeing your progress! The colors on this one are so pretty! I'm looking forward to seeing your progress. Good choice on the fabric for this, Nicole. Will enjoy seeing your progress. I love the colors in this sampler a lot, and don't know why I haven't stitched it before. Maybe because it gets lost in the stash pile. Can't wait to see your start! I love this design! Your colors are beautiful! Ah yes, definitely one of my BBD favourites. Can't wait! I love this one and have stitched it. The real thing looks a lot better than the photo on the chart. It is one of my favourites. I hope you'll enjoy it too! Those colors are gorgeous!!!!!! I'm so looking forward to see your progress. I always love visiting your blog because you have great taste in patterns, and you always have such lovely linens and floss featured in your pictures. Great inspiration, as always!! Ooooh, I can not wait to see you stitch this one! Great design and great colors!! These colours are really pretty. I just love Blackbird Designs. Those colors are lovely, Nicole! I hope you're able to get lots of stitching time this weekend! This is exciting because I just bought this chart! I will love to follow along with you!!!! As you know I could look at your pictures and cross-stitch work all the livelong day!!! May the new start treat you well now that you've found the right place. Oh my I love Blackbird stuff! 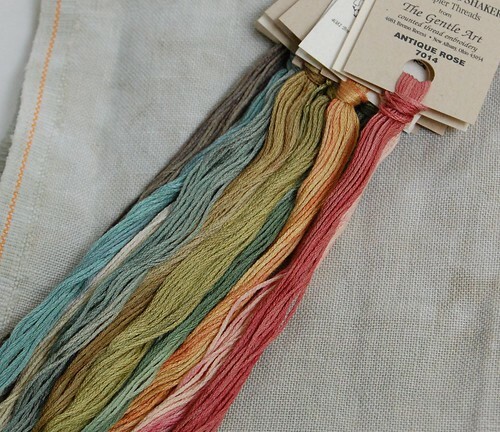 Can't wait to see this sampler come alive under your needle! FYI: I ordered all the supplies for Miss Lila's House from the Attic just now...You are such an enabler! perfect stitch for this time of the year, don't you think? I'll join with everyone else in saying how lovely this chart is. I'm sure you'll love stitching it and I look forward to watching your progress. It will be gorgeous! I love this design, and someday I'll hopefully get to it. Your colors are fabulous! The colors are gorgeous! You have turbo needles ;-). Your work is always very beautiful. May I ask something, I am wondering how many hours you stitch every day. I have just one son, a husband who is out of the house working long hours and I struggle to pick up my stitching once a week, and how long it take me to finish a project, well I don't like to say. You must have a secret, I would like to know, actually, I NEED to know!!!!! I have this one kitted up too and I stitched up the house for a fair and square round recently. Good Luck! I will have to get mine out to stitch up too soon but right now I am working on From Sea to Shining Sea. Thanks for the inspiration.